The latest IT buzz word which has been promoted to death is Cloud computing, which is about as new as AOL (which isn’t really new at all). For those that have been bombarded by the marketing people and still don’t have a clue what they are on about, Cloud Computing is basically being provided with services such as email, CRM systems or online backup storage without having to buy the hardware…you just share someone elses. This means that for the good providers you get a small chunk of some really good hardware with first rate support, for others…well you should be able to guess. It’s the old adage of you get what you pay for! The concept of Cloud computing is about as old as the internet, if you’ve ever had a home broadband connection, or used dial up with your modem to access your emails in Outlook Express, then you’ll be familiar with downloading your emails which are stored in your own little mailbox out on the internet. That’s essentially where it started, but with the improvement in internet connectivity speed, and the greatly reducing price to provide high speed access, then there are a lot of companies jumping on the bandwagon by setting up with a couple of servers in a cheap Data Centre and calling it Cloud Computing. 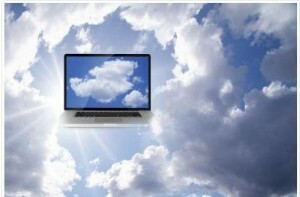 I know for myself, Cloud computing is not a good option. I’d rather have the secure backup in my own home. All I have to do to protect the files if I feel uneasy about it is to put the drive in a fireproof safe. If there is a risk of flood in my area, it’s not hard to take the drive and slip it in my attache along with my laptop and other items I must take with. Cloud is certainly a storage solution I have looked at, but I think for now, I’ll keep doing things the old way until the new way really convinces me it’s the way of the future.